Rumble stripes are grooved into the pavement edge for roadways with no paved shoulder. When the edge line pavement marking is painted through the rumble strip, the grooved surface of the rumble stripe facing the driver can provide a near-vertical surface, which enhances edgeline pavement marking visibility at night and during rainy conditions. A study by the Center for Transportation Research and Education (CTRE) at Iowa State University (Hallmark et al. 2011) evaluated the effectiveness of rumble stripes on rural two-lane roadways in Iowa. Rumble stripes were installed and monitored at seven sites. The project involved milling narrow width (4–6 inch) rumble strips that were a maximum of approximately 5/8 inch deep along the pavement edge of selected roadway sections. The treatment was applied to both curve and tangent sections. 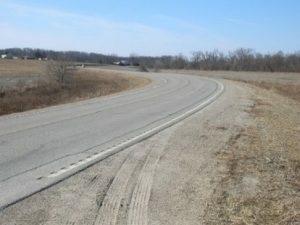 A review of sections after two years of winter maintenance indicated that the pavement markings were performing better within the rumble stripe themselves as compared to sections of flush pavement. This indicates the rumble strips can help preserve some portion of the marking during winter maintenance. The study also found that average offset from the lane center improved by 0.7 feet during daytime conditions and by 0.9 feet during nighttime conditions. This suggests drivers improved lane keeping with installation of the rumble stripes. Two studies were conducted in Iowa to evaluate edgeline rumble stripes (Phase I and Phase II). 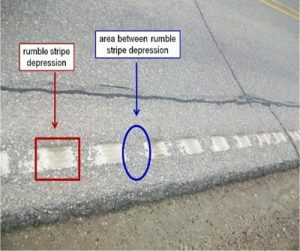 More information is provided in this tech transfer summary, Evaluation of Rumble Stripes on Low-Volume Rural Roads in Iowa (PDF), which summarizes information about edgeline rumble stripes. Hallmark, Shauna, Tom McDonald, and Robert Sperry. Evaluation of Rumble Stripes on Low-Volume Rural Roads in Iowa–Phase II (PDF). Center for Transportation Research and Education, Iowa State University, 2011.